Join us at our store in Orono Maine for educational seminars with equine professionals on a wide variety of topics. Dr. Zev Myerowitz of Myerowitz Chiropractic & Acupuncture Clinic will be here to discuss Equine Lyme Disease detection and treatment. On-again, off-again lameness, low energy levels, a cranky attitude--those signs could point to something as simple as overwork. But Lyme disease could produce all those problems, and it is be a growing problem for horses. Lyme disease can have long-term complications that include damage to your horse's joints, skin, nervous system and even vision. You MUST reserve your seat for this seminar here at GHS as seating is limited; 207-866-8593 or info@gasshorsesupply.com. Not a seminar, but visit us at Cross Insurance Center in Bangor during the PBR Pendelton Whisky Velocity Tour. We will be there Friday, Saturday, and Sunday showing some of our favorite western wear from brands such as Wrangler, Stetson, Justin Boots and MORE. Not a seminar but stop by our booth at the University of Maine, Orono, to see a great collection of outdoor apparel. Everything from hats to boots and all that goes in between. We'll showcase brands like Wrangler Apparel with jeans, shirts & jackets not to mention oilskin jackets & hats from Outback Trading Company. Yes, this means those long "dusters"! We have great western footwear for working outside as well as boots that polish up for date-night. Our store is just a few miles down the road, stop by 476 Main St., Orono while you're in town. 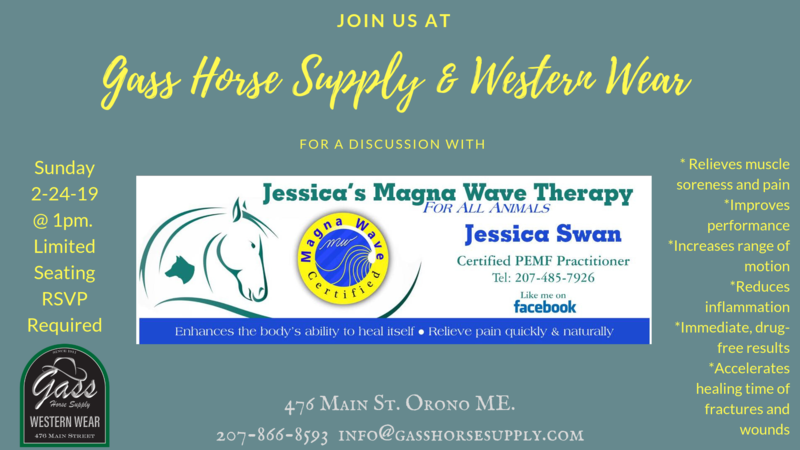 GHS is pleased to partner with Jessica Swan of "Jessica's Magna Wave Therapy" to offer our valued customers and followers an educational seminar about naturally and quickly relieving pain for our four legged friends. Magna Wave PEMF is a Pulsed Electro-Magnetic Frequency delivered through a coil placed on your horse by a Certified Practitioner to increase blood oxygenation, reduce inflammation and pain, stimulate acupuncture points and promote a happy, healthy horse. Q&A Session during and following the presentation. 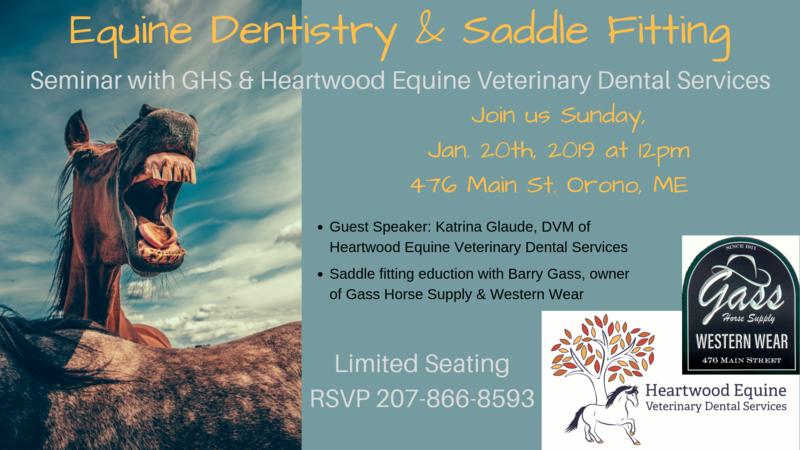 Come join us on Sunday, January 27th @ 12PM for a lively and informative discussion about equine dentistry followed by a western saddle and pad fitting discussion. Dr. Katrina Glaude will present on the topic of equine dentistry promptly at 12 Noon followed by Barry Gass presenting on the topic of western saddle fit and pad usage. Both topics will discuss the importance of keeping our horses comfortable to ensure a happy and healthy horse. Q&A Session during and following the presentations. Limited seating and RSVP is required. Light refreshments will be served. 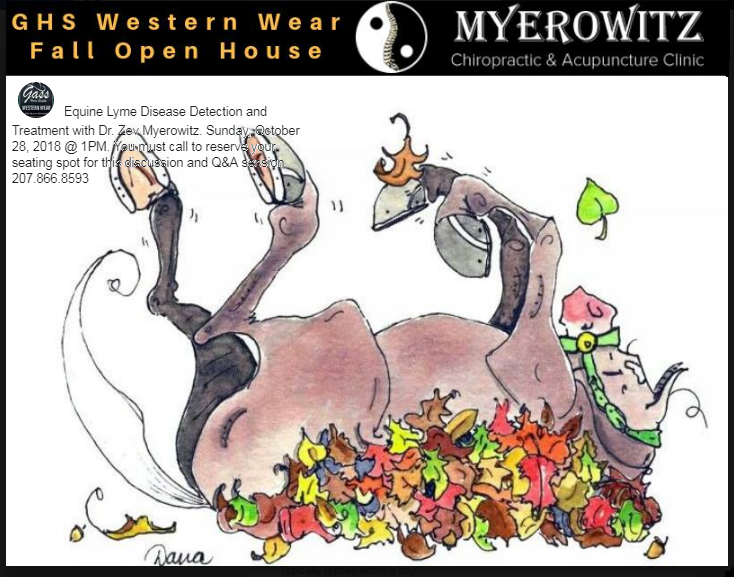 Dr. Zev Myerowitz of Myerowitz Chiropractic & Acupuncture Clinic will be here to discuss Equine Lyme Disease detection and treatment. You MUST reserve your seat for this seminar here at GHS. Light refreshments at 1PM and presentation will begin at approximately 1:30PM. There is very limited seating for this event. Please RSVP for table space on Saturday and/or a seat for the Lyme detection/treatment session via phone (207-866-8593). NOTE: Lyme detection/treatment discussion is now FULL - Please call for your spot on our Waiting List. Another date will be set soon for this important and popular topic.